Salt Lake City (April 15, 2016) – The SCOTT Enduro Cup presented by Vittoria announced that the final stop of the 2016 race season. Deer Valley Resort will host the Park City, Utah race on Aug. 28, 2016. Registration will open for the Park City race stop on Friday, April 22. Registration for Moab, UT (May 7), Angel Fire, NM (June 11-12) and Sun Valley, ID (June 25-26) are currently open. Deer Valley Resort enlisted world-renowned bike park development company, Gravity Logic, to embark on the resort's largest-ever investment to modernize and update its existing mountain biking trail system. During the summer of 2015, they built the incredibly popular flow trail, Tidal Wave, and made improvements to many existing trails. Deer Valley is continuing their expansion this summer, 2016 with a new flow trail called Holy Roller. 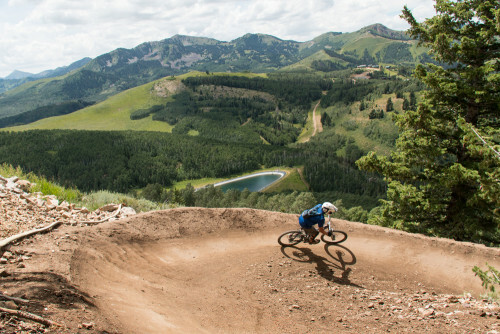 Fresh berms, rollers and jumps will leave no question as to why the International Mountain Bicycling Association (IMBA) dubbed Park City, as a Gold-Level Ride Center, an honor that was reconfirmed in 2015. See https://www.imba.com/ride-centers/current/park-city. The SCOTT Enduro Cup presented by Vittoria will award $12,000 cash to the podium place finishers in the open class at each race stop. Podium place amateur riders will be awarded with product provided by race sponsors. Vittoria is sponsoring a prime, the Vittoria Bolt, at each race location for the fastest downhill time of a designated stage. One male and one female racer will win the prime awarding each a $100 cash prize. Sun Valley, ID, (June 25-26) and new this year, Angel Fire, NM, (June 11-12) races are now officially sanctioned by the North American Enduro Tour (NAET). This acknowledges both races as qualifiers for the Enduro World Series. Read the press release. ROTOR, the Spanish bicycle component company with offices in Utah has signed on as a sponsor of the SCOTT Enduro Cup. ROTOR is known throughout the world of cycling for creating innovative, out-of-the-box products and is working to expand outreach in the U.S.
For registration information, visit endurocupmtb.com. Registration is open to men and women, professional and amateur adults and juniors ages 13-18. Riders can choose to participate in a single race or purchase a season pass. In addition to race entry, all registration fees include an event T-shirt, lunch and lift tickets (where applicable). In order to collect points to qualify for the Enduro World Series, racers will need to obtain an EMBA license through EWS.